The Mayan civilization grew to be one of the most culturally and scientifically advanced peoples of their time period. Then, inexplicably over a fairly short period of time the Mayan civilization, in all greatness and advancements, totally disintegrated. There have been numerous theories on how the Mayan civilization seemed collapse so quickly, including disease, invasions from other peoples and famine due to extended droughts. Well, it appears the thesis about droughts leading to widespread famine has gained a lot more credibility after some researchers, including those from the University of New Mexico were able to accurately deconstruct and date mineral deposits on an ancient stalagmite found in a Belizean cave. The precise levels of rainfall over a period of time were ascertained through a process of radiogenic isotope dating and analysis at the University of New Mexico. 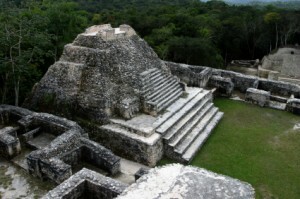 The analysis clearly showed a period of decreased rainfall which coincides with archeological and historical dates that researchers say the Mayan civilization collapsed. The cover story in the jour­nal “Sci­ence” this week fea­tures long-term research by an inter­na­tional group of anthro­pol­o­gists and earth and cli­mate sci­en­tists, includ­ing researchers from the Uni­ver­sity of New Mex­ico, who took a care­ful look at the impact of cli­mate change on Maya polit­i­cal sys­tems. Their paper, “Devel­op­ment and Dis­in­te­gra­tion of Maya Polit­i­cal Sys­tems in Response to Cli­mate Change,” explores the effect of vari­a­tions in rainfall. To doc­u­ment the rain­fall amounts, the group ana­lyzed a sta­lag­mite from Yok Balum cave in Belize. They pre­cisely tracked an increase in rain­fall between A.D. 450 and 600, then a decline in rain­fall, punc­tu­ated by a series of short droughts 200 years later. The pre­cise chrono­log­i­cal recon­struc­tion of the cli­mate record was con­ducted at the Radi­ogenic Iso­tope Lab­o­ra­tory at UNM Earth and Plan­e­tary Sci­ences, directed by Prin­ci­pal Inves­ti­ga­tor Yemane Asmerom along with Senior Research Sci­en­tist Vic­tor Polyak and anthro­pol­ogy doc­toral stu­dent Val­o­rie Aquino. Some of the tech­ni­cal work was done by Aquino who drilled tiny trenches in the sta­lag­mite and mea­sured ratios of Ura­nium and Tho­rium iso­topes from pow­ders to accu­rately date the age of dif­fer­ent lay­ers linked to cli­mate change.